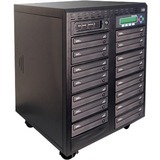 The Kanguru Daisy Chain DVD Duplicator with Built-In Hard Drive is a high-speed, stand-alone recording system with a feature rich LCD. Kanguru's Daisy Chain DVD Duplicator can operate fully independent. When connected together in a daisy chain configuration, you can link up to 60,000 towers for a total of 900,000 DVD burners operating in unison through a single master tower. This is the perfect solution for anyone that is looking for a scalable approach to increasing their DVD production output.